Pamela Talese is known primarily for paintings done on site in Brooklyn and Queens, and for her brightly colored still lifes. 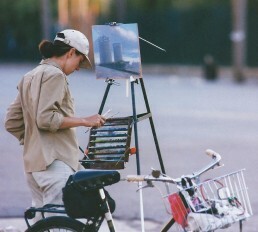 She is currently developing a new series of cityscapes done on location in Rome, Italy. Talese has exhibited regularly in New York City and environs since 2003. Her work has been featured in The New York Times, The Wall Street Journal, ArtNews, Fine Arts Connoisseur, CityARTS, and other publications. Her paintings are in many private collections in the US and abroad, and in the collection of the New York Historical Society. Talese has been an artist in residence at The Ucross Foundation in Wyoming, The Josef & Anni Albers Foundation in Connecticut, the visiting artist program at the American Academy in Rome, Italy, and the Cill Rialaig artist in residence program in Country Kerry, Ireland.